The 24.5-megapixel mirrorless shoots at 12 fps and 10-bit 4K. After many leaks and teases, Nikon has unveiled the Z6, a full-frame mirrorless camera that might tempt many photographers away from Sony's A7 III. It has very similar specs to that model, including a 24.5-megapixel full-frame sensor with 100-51,200 native ISO, 12 fps continuous shooting, 273 autofocus points and 4K video. 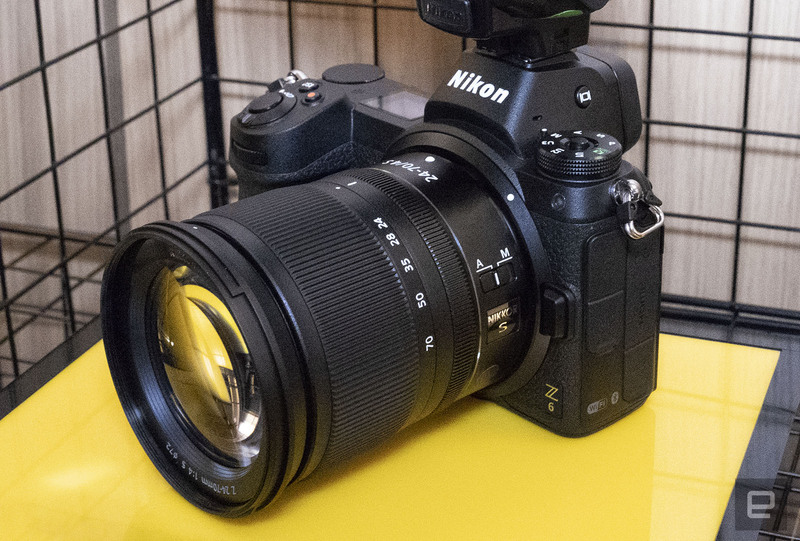 Nikon's Z6 has a much bigger lens mount, however, and a chunkier handle that's easier to grab, especially when there's a humongous lens attached. It's a clear call-out to some of the pros who aren't crazy about the ergonomics of Sony's A7-series cameras. 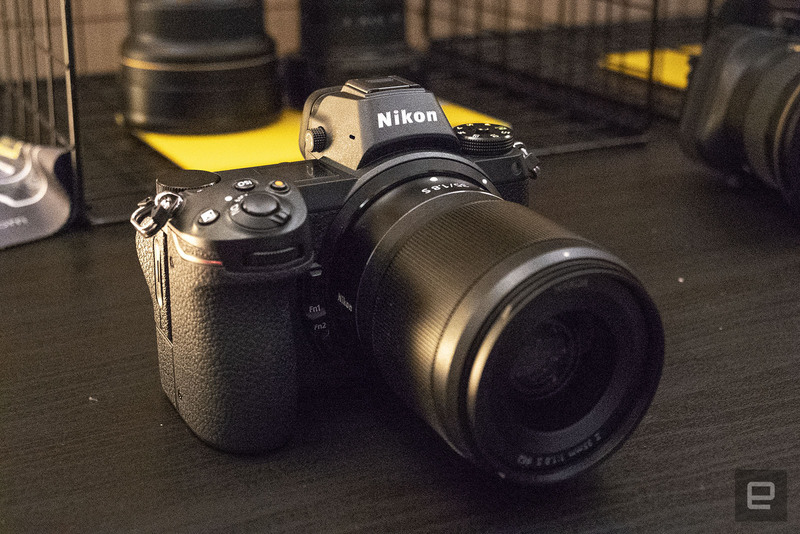 Nikon's Z6 is identical on the outside to the flagship Z7, and the two models share many features. Both have 5-axis in-body stabilization ("VR or vibration reduction"), a first for Nikon interchangeable lens cameras. They share the same menu UI, and offer Bluetooth LE and WiFi with SnapBridge/PC support. Unfortunately, they only support Sony's XQD memory cards and there's just one slot, but CFexpress Type B card support is coming later. Each has a rear touch display for both menu and shooting functions, but unfortunately for vloggers, it only tilts and can't flip around. Apart from that, it's all good news for videographers. There are dedicated headphone and microphone ports, and both cameras support 4K video at up to 30 fps, and 120fps at 1080p. Both the Z7 and Z6 also support phase-detect AF for video, bringing Nikon up to par with Sony and Canon. Better still, you can record 10-bit 4K video with Nikon's N-log color profile via the HDMI port to an Atomos or other recorder. Nikon claims 12-stops of dynamic range using that mode, which will be a boon to videographers who want maximum control over color and contrast. The main differences between the Z6 and Z7 are related to the sensors. The Z6 has lower resolution (24.5 megapixels compared to 45.7 megapixels for the Z7), and 273 autofocus points compared to 497 for the Z7. On the plus side, the Z6 has bigger pixels that can gather more light, so it offers an ISO range of 100-51,200 compared to 64-25,600 ISO for the Z7. It can also shoot faster, at 12 fps compared to 9 fps for the Z7. For video, the Z6 can do a full-frame sensor readout, while the Z7 must bin (skip) pixels for full-frame capture, or crop the sensor to APS-C (DX) to avoid that. Along with the new cameras comes an all new lens system, the Z-Mount. It has a 16mm flange distance, a third of that on the F-mount, and a 55 mm diameter that's 17 percent larger. The smaller flange allowed Nikon to create more compact, super-wide angle lenses they couldn't before, while the larger opening allows more light to get to the sensors and corners. That in turn let Nikon design crazy, ultra-bright lenses that stay sharp from edge to edge, like the upcoming 58mm f/0.95 Z-Noct Nikkor. Nikon unveiled the first three Z-Mount lenses to go with the cameras, the 24-70mm f/4 zoom, 50mm f/1.8 prime, and 35mm f/1.8 prime. Three is pretty limiting, but if you already have lots of Nikon glass, the company also showed off the $250 FTZ F-Mount adapter that works with all 90 current Nikkor lenses. You won't lose any image quality with the adapter, as it has no optical components, and it supports autofocus, AE lock, focus peaking, silent shooting and in-body stabilization. Nikon also plans to release another dozen or so lenses over the next couple of years. The adapter solves the lens problem for DSLR users, but then there's the thorny issue of the electronic viewfinder. Many DSLR-using pros are still suspicious of EVFs, feeling they don't provide the immediacy and clarity of a true optical viewfinder. Nikon's answer is a 3.69 million dot 0.8X OLED EVF with 100 percent coverage. Nikon believes the EVF optics are as important as the OLED they're in front of, so they use anti-reflective aspherical lenses and a fluorine coating on the eyepiece window. At an event in London, I had a chance to shoot with the Z6 (though not keep the images, unfortunately). So far, it seems Nikon has done exactly what I wanted it to in order to compete with Sony, and then some. The Z6 feels very rugged, and thanks to the larger handle, has better ergonomics than the A7 III, I found. At the same time, it's surprisingly lightweight. The Z6's shooting speeds are as fast as I had hoped, and for the most part, it nailed focus in wide, face-tracking and spot AF modes. After several minutes of shooting runway models, I had very few out-of-focus shots. The video system also has phase-detect autofocus (a first for Nikon), and I found that it could track subjects and refocus at least as well as the Sony A7 III, if not better. Whether it's up to Canon's high standard remains to be seen, however. Using the new adapter, I shot a with two F-Mount lenses, the Nikkor 14-24mm f/2.8 and 24-70mm f/2.8. For comparison's sake, I also shot with the new Z-Mount 35mm f/1.8 prime and 24-70mm f/2.8 models. The older lenses worked perfectly, in terms of autofocus speeds and accuracy, and had no apparent quality degradation compared to the Z-Mount lenses. The adapter doesn't add much bulk or weight, so shooting with a large F-Mount lens on the Z6 would be just as easy, if not easier than with a D4 or D850 DSLR. I had really hoped that Nikon would go all-in on video since they don't have any dedicated video cameras to cannibalize. They did just that by offering 10-bit video to compete with Panasonic's similarly priced GH5s. Only 8-bit video internal recording is possible, but rival Sony cameras don't offer 10-bit 4K video recording of any kind. In any case, external 10-bit video will allow higher data rates, and N-log profile will make it easier to color grade and create HDR videos (above). The Nikon Z6 does look extremely promising (stay tuned for a full review), but what about the all-important price? There's more good news there. The Z6 will arrive later this year, after the release of the Z7 in September, for $2,000 (£2,099), and $2,600 (£2,699) with the 24-70mm f/4 kit Z-Mount lens. That, you may note, is identical to the cost of the Sony A7 III, so there's finally some serious full-frame mirrorless competition -- and that can only be good for the rest of us. Update: Pre-orders for Nikon's Z6 full-frame mirrorless are now open at B&H Photo, Adorama and elsewhere.